play it one more time – one more for the road. As soon as I read about Padella (here), it shot straight to the top of my list. And so, after work on Tuesday, we wandered over there and joined the queue. Cut to me, on a loop: Let’s get the burrata with Puglian olive oil and the borlotti bean bruschetta and some bread and share! 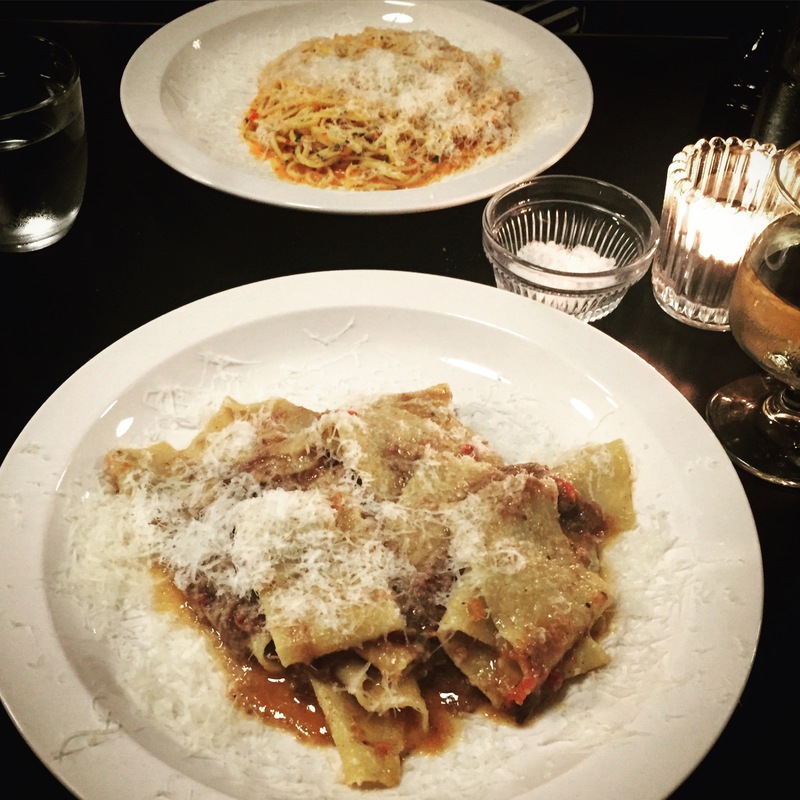 Then I’m having the pappardelle with 8-hour beef shin ragu! Did you know it’s their signature dish! Then I’m going to have the chocolate tart! You should have the almond one! Do you want wine? I’m having wine! Etc. and so on, until we were finally seated at a table downstairs (which means my one and only photograph is sadly lacking in marble). The food and drinks menus are small but perfectly crafted. A handful each of antipasti and hand-rolled pasta dishes, plus a couple of desserts. Trustily-chosen wines, beers, a few cocktails – and if you want a coffee? That’ll be an espresso or macchiato or nothing. Our dishes were all delicious. The pappardelle was the type of tasty you never want to end, but actually, we concluded, not a huge leap away from the kind of thing I make at home if I have 4 hours to spare on a Sunday. The taglierini with ‘nduja, mascarpone and parsley , however, was like nothing either of us had ever tasted. Hot, fresh, zingy, incredible. Next time, I plan to skip dessert and order an extra pasta dish – they’re cheap and modestly sized and just because. My favourite bit of all? That the menu beseeches: please tell us if you don’t want parmesan.